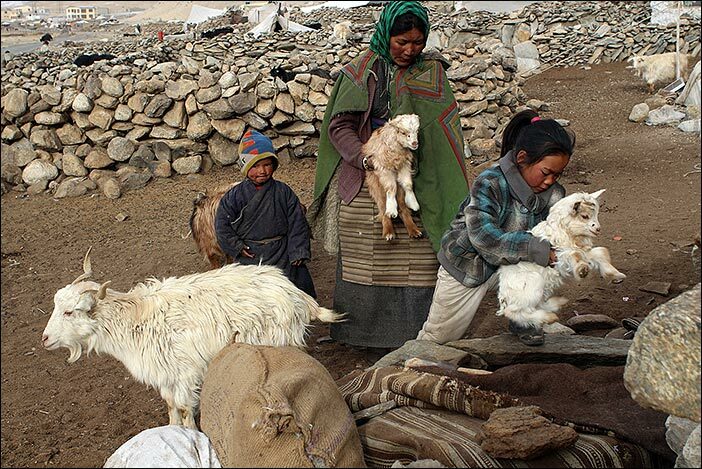 In Changthang in Ladakh nomads are living above 4.200 m. No agriculture is possible here. 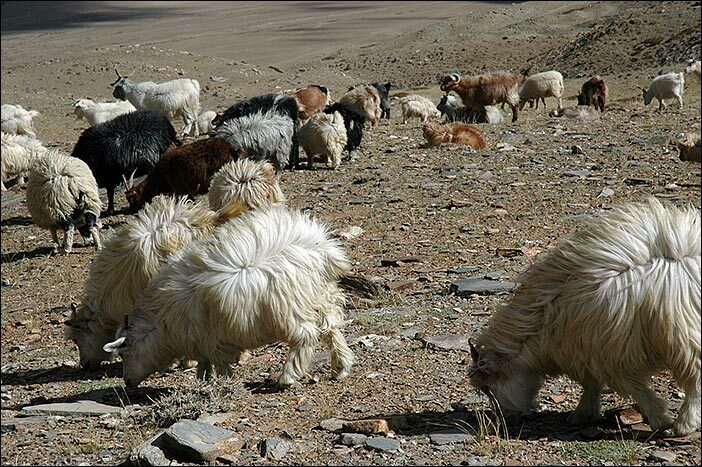 Instead the herders walk daily with their huge flocks of goats and sheep on the meagre mountain pastures. The winetrs are icy cold, but especially therefore the goats are growing very smoth and cuddly hairs, which warm them very well. 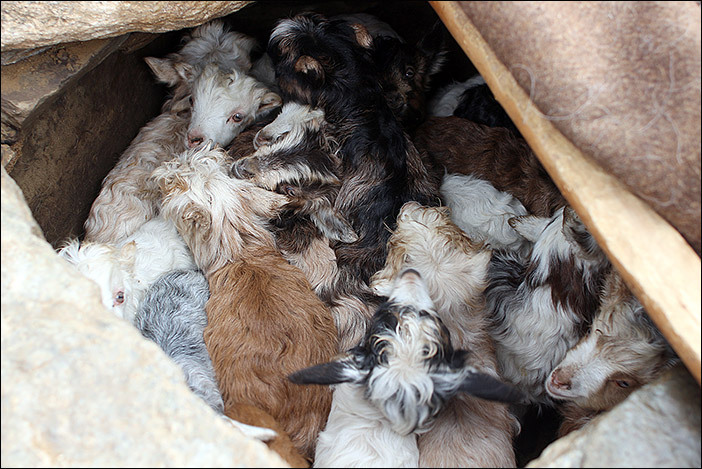 The babies of the goats are born in January. To avoid freezing to death they have to be stuck in hole in the earth with a blanket over it for the night. Morings and evenings they are brought to their mothers for drinking. 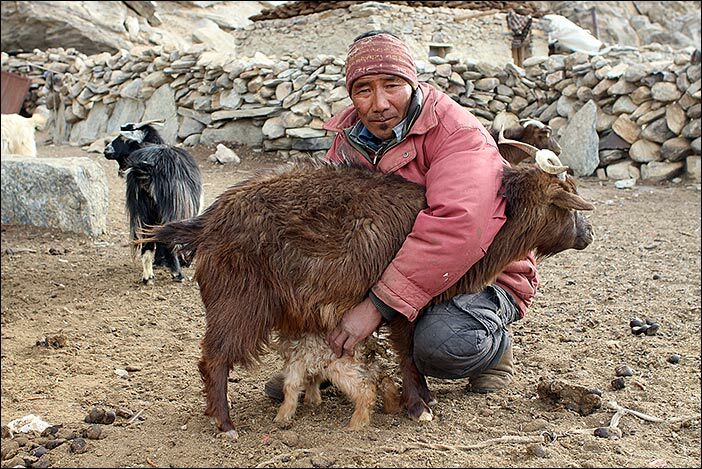 During this time the goats are not milked as all of it goes to the offspring. From springtime to the beginning of the summer it is time to remove the hairs. These are combed out and collected. 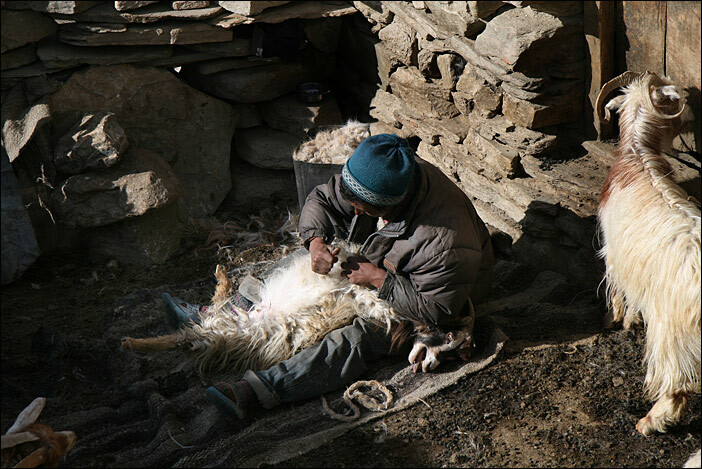 All nomads deliver the hair to the processing unit in the capital Leh. This was the first of its kind and finished in 2004. 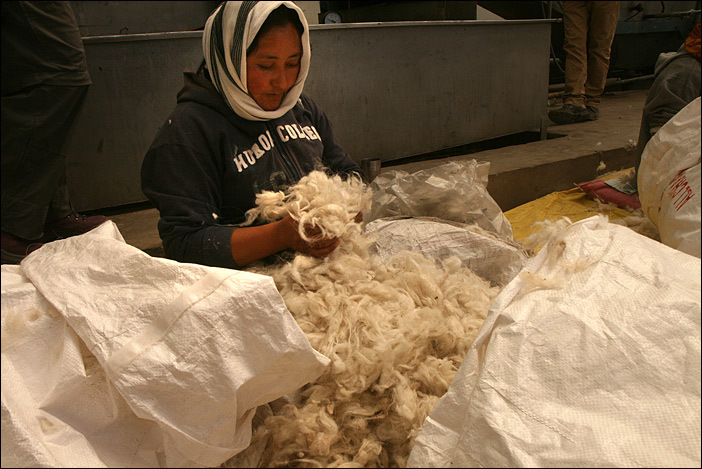 It was a very important step for bringing the processing to Ladakh (until then people from Kashmir and Himachal Pradesh bought the raw material and paid mostly too small money to the nomads, who didn’t know about the fair rates on the market). This unit is organised by a society, which also cares about good market-rates. First the raw material will be separated by colour. White is the most wanted one as it is easiest to dye it. There are three different tones in colour. 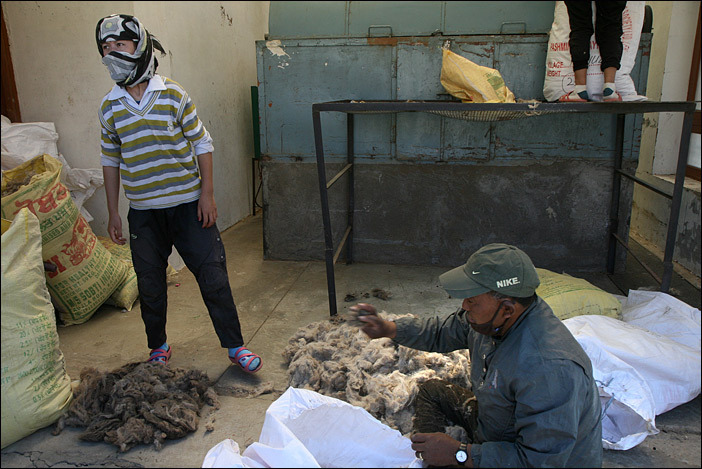 After that the raw material goes to the “laundry”. Grease and dirt will be washed out here. 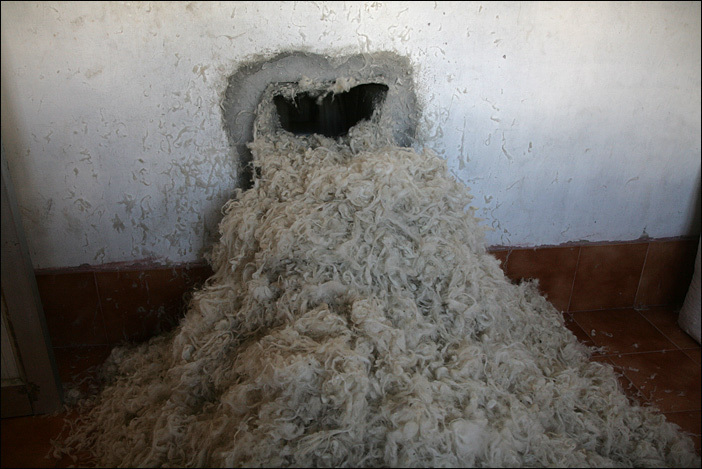 After drying it will be conditioned. 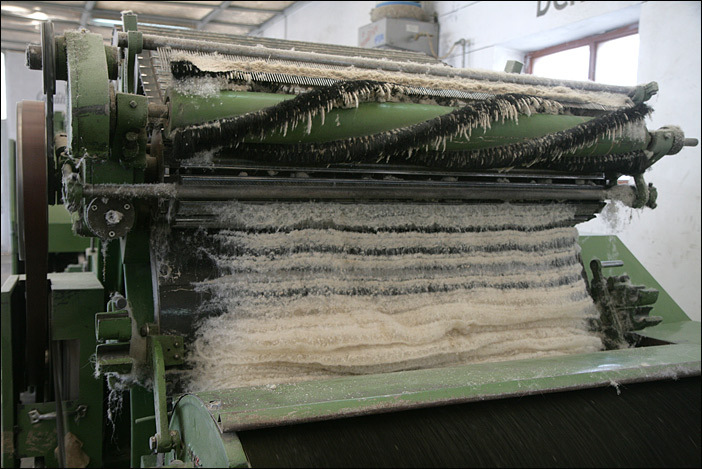 The last machine cards the material and turn it into an extreme soft “tuff”. 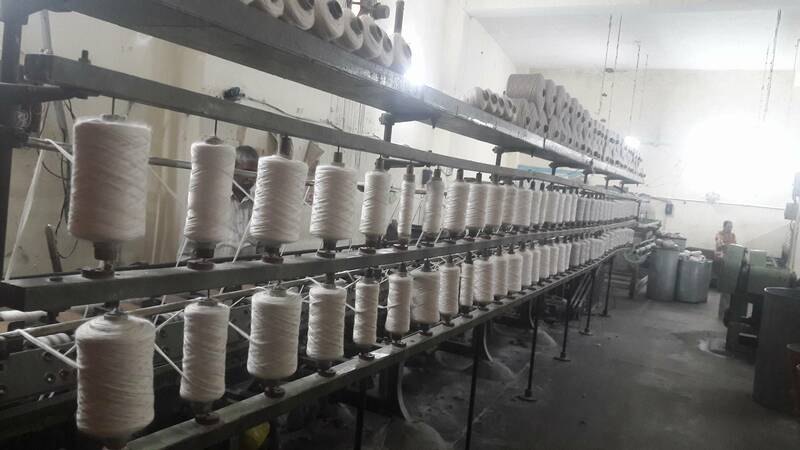 Spinning can be done by hand or machine. 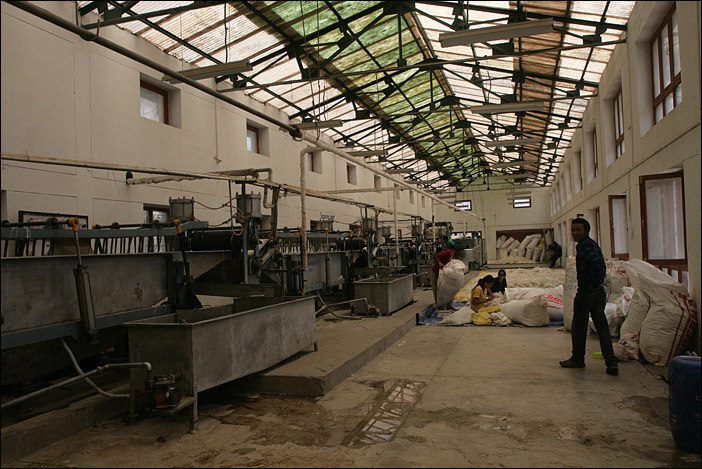 This machine is located at Pathankot in Himachal Pradesh. 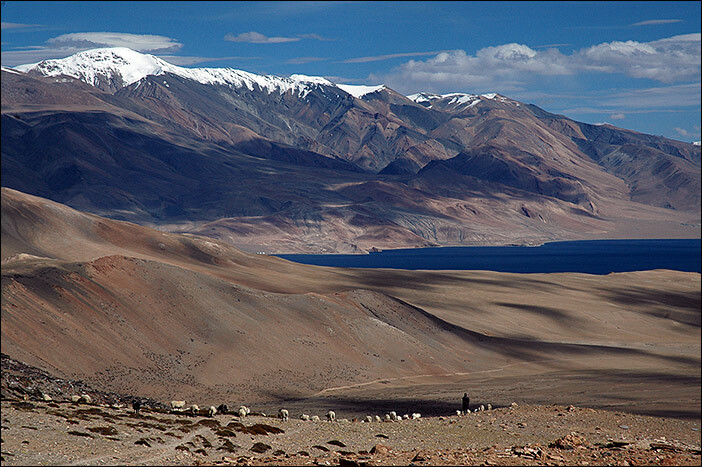 She needs humidity, constant power and warm temperatures – all this is lacking in Ladakh. 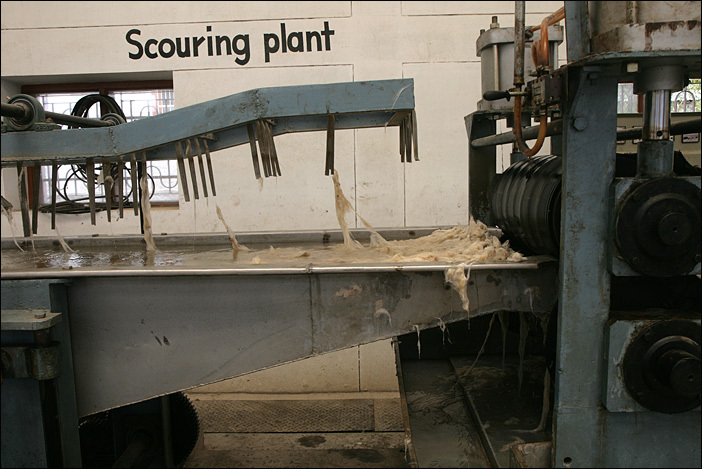 Also the weaving can be done by hand or machine. For sure machines are cheaper. 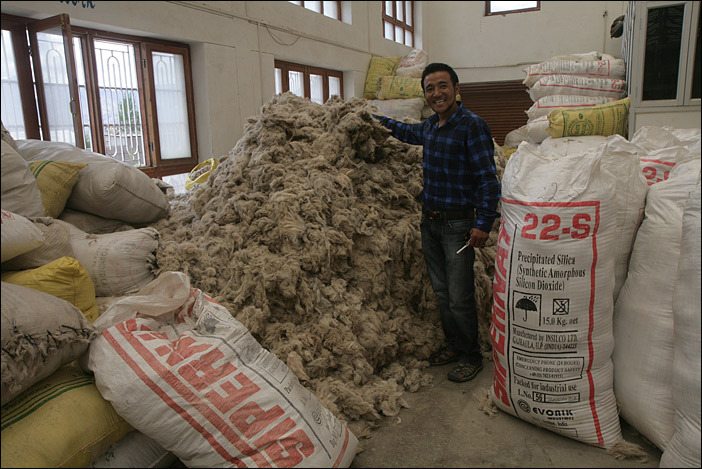 The one in Himachal Pradesh has 17 employers (photos will follow). 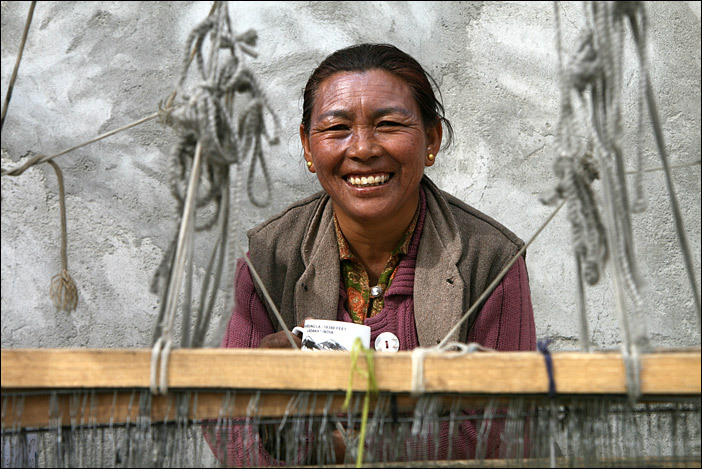 In Ladakh they try to learn and get experiencend in handweaving. 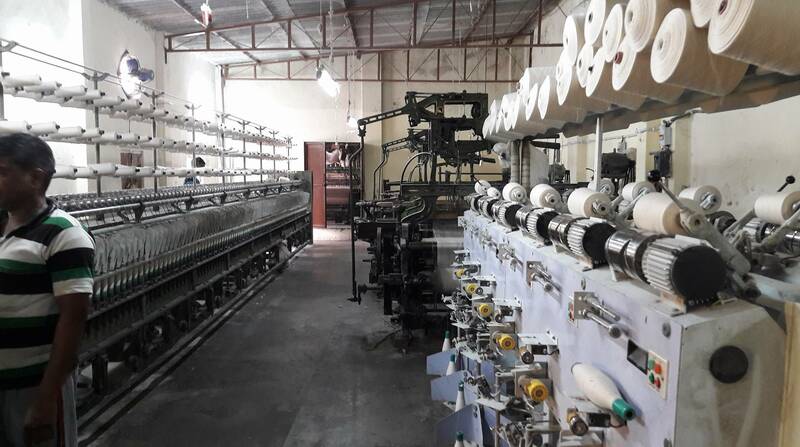 But with this fine material it is not easy and one needs good experience. 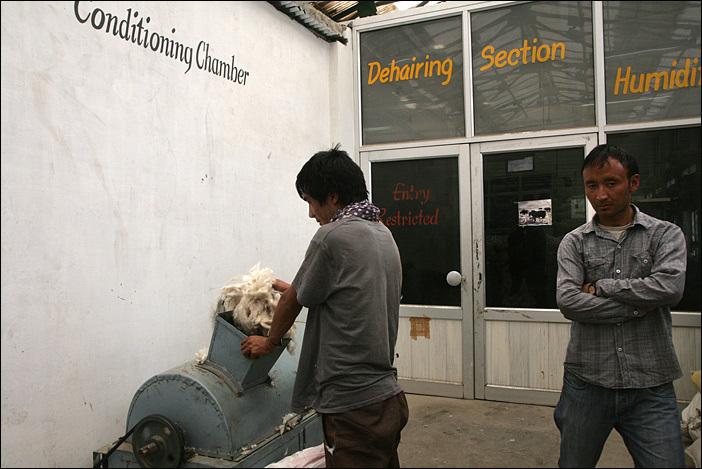 Angdus Dolma, also from Changthang, is learning to manage the weaving of cashmere-shawls. 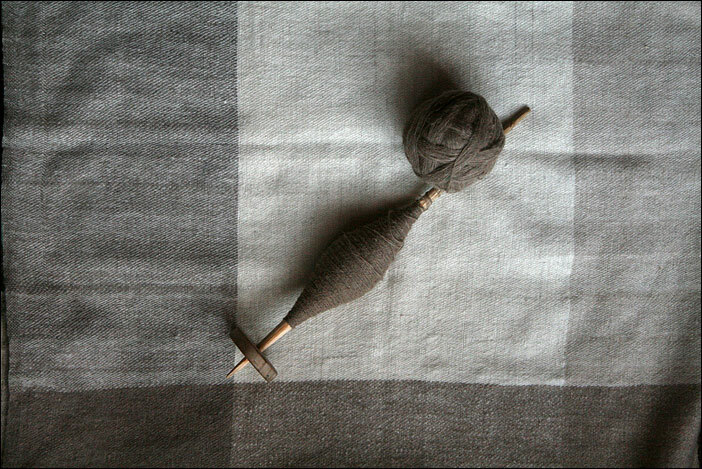 Nawang Phuntsog takes care of qualiry, patterns and colours. There are many different pattern- and colourcombinations. In the end there is a big variety of most beautiful shawls. 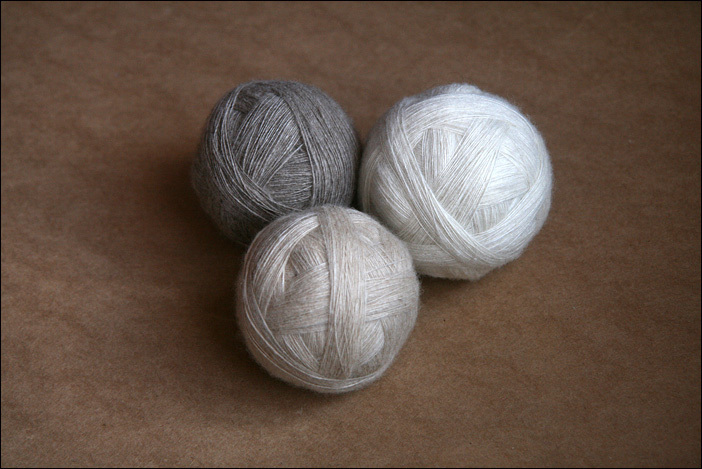 These are going to the nice shop in Leh, der Nomadic Woollen Mill. And now they are available in Germany, too!